Are you a real yoghurt lover? If you love yoghurt with a sharp, slightly dry but tangy flavour then we have the product for you. At our small dairy we make yoghurt in small batches with fresh milk from Hipley Barn Farm. The milk is heated (nearly boiled) then cooled and a culture added. The culture is especially selected living bacteria that turn the milk sugar (lactose) into lactic acid. This gives yoghurt its unique flavour. In our Natural Yoghurt we use a traditional culture to give it a tangy mild flavour and thick texture… delicious! The fruit yoghurt uses a more modern culture containing bifidobacterium and has a much lighter texture. Both are low fat and contain ‘live’ (good) bacteria. 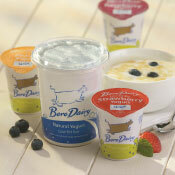 Natural Yoghurts are available from local stores and farm shops in 150g and 450g pots. We also produce a 2.3L bottle for catering. Fruit yoghurts are in peach, strawberry raspberry and cherry flavours in a 125g pot. We also produce a thick set, fresh soured cream ideal for Mexican/American dishes, available in a 2.5L for the catering trade. Now you may laugh… but when I was growing up on a farm in Cornwall and watching mum scald fresh cow’s milk on the Rayburn, I didn’t know any other cream existed. Our fresh milk comes from Hipley Barn Farm where the cows graze lush pastures to give us perfect, sweet, golden cream that we slow-bake to produce our thick, golden crusted clotted cream. Cream teas of course but on top of fruit salad, melting over hot apple pie & even on ice cream, it makes everything special! 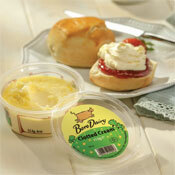 Our clotted cream is available from local stores & farm shops in 113g and 226g pots.